Wendy Melcher, left, was named the 2016 Little League Southeastern Region Challenger Division Volunteer of the Year after receiving a nomination from former Dulles Little League President Jim Klock, right. 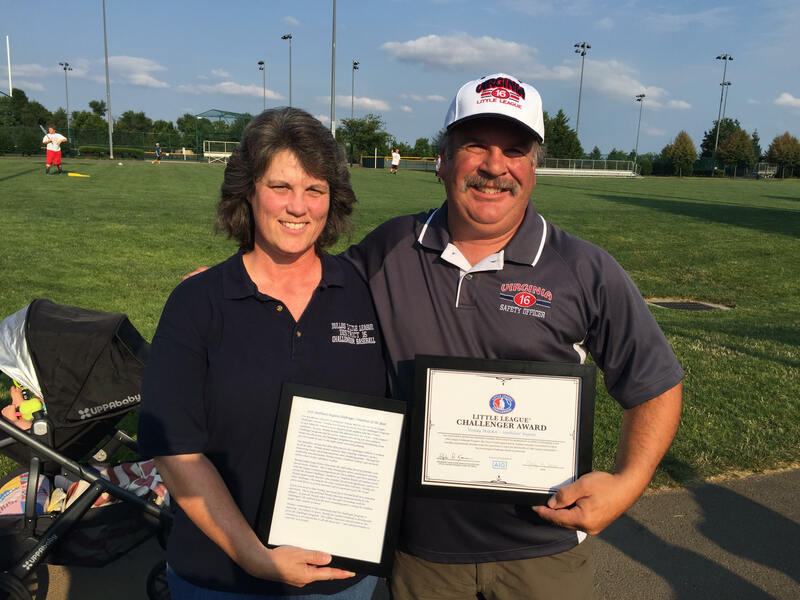 When Dulles Little League Challenger Division Director Wendy Melcher first started volunteering with the Challenger Division in Loudoun County nearly two decades ago, she never dreamed of the success the new program would have in the rural suburbs of Washington, D.C. But through her dedication, the division has grown from two teams in 1997 to eight teams in 2016. On June 14, the Little League Southeastern Region named Melcher the 2016 Challenger Division Volunteer of the Year. After searching around for a Challenger Division for her nephew Aaron to participate in in the late 1990s, Melcher found there was not a team in Loudoun. Her early determination meant the Little League Challenger Division was born in Loudoun in 1997 with two teams. Every Saturday afternoon, dozens of athletes, parents, friends, fans, volunteers and Melcher head to the field to play ball. Even 19 years after organizing the first local teams, Melcher still enjoys the excitement the game brings to these athletes. A friend to Klock, Melcher is so much more to these Challenger Division athletes. She is the reason they get to play the game they love, making friends of their own along the way. ← Greater Fauquier Baseball Little League are Seniors Baseball Champs!